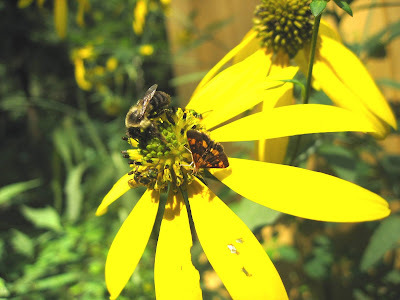 A bumblebee, metallic sweat bee, and orange-spotted mint moth all feeding on a native green-headed coneflower in the native plant garden at Long Branch Nature Center. Happy National Pollinator Week! There are over 200,000 species of pollinators worldwide. These include such diverse animals as bees, wasps, butterflies, moths, flies, beetles, and hummingbirds. We owe them much, as it is often said that one out of every three bites of food we enjoy is due to the direct actions of an animal pollinator. In fact, three-quarters of all plants regardless of whether we eat them or not depend on animal pollinators in order to reproduce. When thinking about planting things to benefit our pollinators who benefit us so often, a critical thing to consider is the use of native plants. Studies show that native plants are four or more times more attractive to native pollinators than exotic plants. This, of course, makes perfect sense since these plants and animals evolved together, sometimes to the point that one cannot exist without the other. Many caterpillars for example cannot survive without their specific native host plant to feed on. About a third of our native bees need the specific pollen of certain native plants or they cannot reproduce. So the most important consideration is to plant plants that are locally native. These plants are not only adapted to grow in this type of habitat, but are what the pollinators have been using for thousands of years. It is also always best to use straight wild species,rather than cultivars or nativars which have been selected for certain traits. When we plant a flower that has been bred to appeal to us through a novel color or look, it may not have the same appeal to the pollinator its parent plants originally evolved with. What might be attractive to us may not be attractive to pollinators, some of which see flowers through different spectrums or look for certain traits in them. This is especially true of plants bred to have double flowers or blooms with extra large petals, since they often sacrifice nectar/pollen for the extra showy flowers. Also something to consider are the multiple uses you get with native plants. Many exotic plants may have a pretty flower that may (or may not) provide nectar for a short time each year while blooming, but it otherwise provides little habitat or nutrition for pollinators or other native wildlife. Take the Chinese Aster (Callistephus) for example. It is a pretty flower, comes in many color forms and is widely planted (and has escaped and naturalized into some areas). The blooms on some varieties provide some nectar and pollen to a few pollinators for a short bloom time each year. But only two species of caterpillars have been recorded as feeding on it. It is for the most part and for most of its plant life a barren habitat for wildlife, taking the place of what might have been a much more beneficial native plant. Contrast that with one of our many (Virginia alone has 43 different species) colorful and attractive native asters, many adapted to a variety of growing conditions. Now you have flowers that not only provide attractive flowers for the garden and a similar look, but also serve a habitat and food function. In addition to pollinators visiting them, most also supply seeds for birds such as finches and sparrows. But 109 different caterpillar species have also been documented feeding on asters. These in turn feed the vast majority of our nesting native birds (97% of terrestrial birds feed on insects, particularly during the nesting season, most of which are caterpillars) and most of the 18 bat species found in our region (all of which are insectivores and many of which prefer moths over other insects). At least 8 different bee species need their pollen or they cannot reproduce. 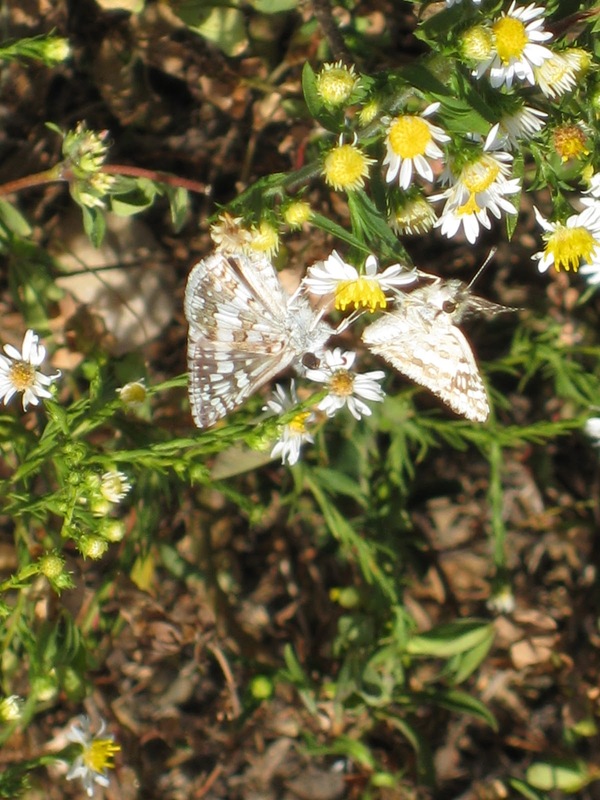 A pair of Checkered Skippers feed on a native aster. So you can see how something as simple as choosing a native plant species can not only serve to provide for pollinators, but then serve many other habitat functions as well. 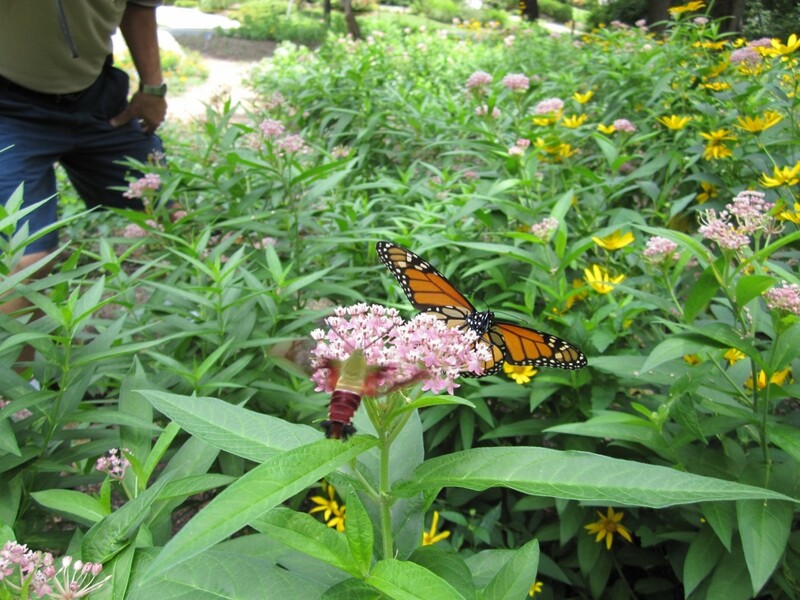 So this National Pollinator Week, enjoy the pollinators in our gardens, farms, and parks. If you're able to, include locally native plants in your gardens. This way you too can help the pollinators who are always helping us. The establishing of Pollinator Patches and Monarch Way Stations is just one way we will continue to do so in to the foreseeable future. Please join us in supporting our pollinators by planting native plants when you can and taking pollinator needs in to consideration when you do things at home. A Monarch Butterfly and Clearwing Moth nectar at a native Swamp Milkweed flower in the Gulf Branch Nature Center Monarch Way Station and Pollinator Garden.